Collaborate With : Center of Islamic Economics & Finance (CIEF) - Pakistan and Ikatan Ahli Ekonomi Islam Indonesia (IAEI). IKONOMIKA has been a CrossRef Member member since 2017. Therefore, all articles published by IKONOMIKA will have UNIQUE DOI and OAI number. IKONOMIKA : Jurnal Ekonomi dan Bisnis Islam. 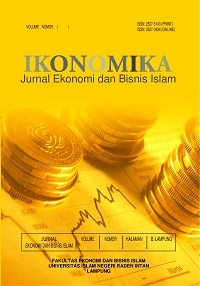 (the content focuses on syariah econimics) for May and October edition.